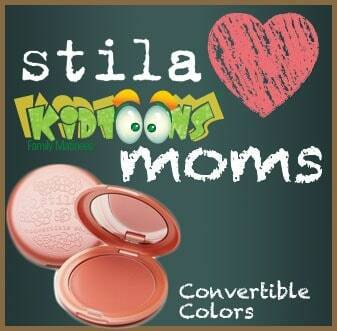 I am so excited to introduce you to Stila Convertible Colors cosmetics and Kidtoons® Family Matinees who are teaming up on a fabulous promotion to celebrate the beauty of moms. In fact, you can enter for a chance to win the Stila Loves Kidtoon’s Moms Contest on Facebook with a grand prize of a $500 Stila Cosmetics Gift Basket or 50 second prize winners will receive a Stila Lip Glaze & Illuminating Tinted Moisturizer! Stila Convertible Colors are just beautiful and a “must-have” in my daily beauty routine. This dual lip and cheek cream instantly brightens my face with just a touch of sheer tint. I love how easy it is to apply this product and in less than a minute, a touch of the “Rose” color elevates my face from having a pale complexion to a lovely, polished glow. I appreciate that it blends easily and gives a really pretty, natural appearance. As a busy mom who doesn’t always like to apply a lot of makeup, Convertible Colors are perfect. I like the pretty mirrored compact that fits nicely in my handbag so it is perfect for taking on the go too. There are a wide variety of shades to compliment every skin tone and I love that the Stila website includes a feature that offers “Personalized Makeup Artist Picks” for my hair, skin and eye tone. It is very helpful in suggesting shades that would be particularly flattering for every individual. WOW! Stila and Kidtoons are hosting a fantastic $500 Stila Cosmetics Gift Basket Contest on their Facebook page! In order to enter the Stila Loves Kidtoon’s Moms Contest, simply head over to their Facebook page and complete the entry form. Are you ready to enter…….if so, hurry over here now for your chance to win! Don’t forget to mention it was Simply Stacie who referred you on the entry form because we are participating in our own Stila contest. You can also save 20% off your entire purchase and score free shipping at the Stila website by using the code STILAMOM. Many thanks to our friends at Kidtoons Family Matinees for offering Simply Stacie readers a chance to win a Stila Convertible Colors dual lip and cheek cream in “Rose”. If you are not yet enjoying Kidtoons Family Matinees with your own family then you are invited to head over to the Kidtoons website to find a location in your area….it is a lot of fun! You can connect also connect with Kidtoons on Facebook and Twitter. Thirst No. 4 Sneak Peek | Read Chapter One! Stila is MY brand!! I love it mucho. I use the black waterproof eyeliner crayon the most. Thanks! I would like to try their in the light palette of eye shadows.